Last weekend we decided to treat ourselves to some magazine for some crafty inspiration. Poppy, my 4 year old, wanted a magazine too so after wading through all the magazine suitable for children in the newsagents my husband discovered this!!!! 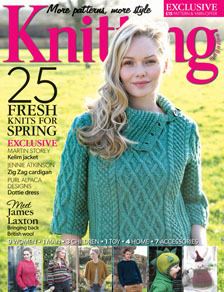 It’s a brand new craft magazine for girls called Ruby Loves that was released on 27th March. The magazine comes with a craft kit so that you can make the 6 step-by-step projects included. After Poppy flicked through the magazine I asked her what she would like to make and she announced that she’d make the kitten key ring. With Elsie having a Sunday afternoon nap, it was the perfect time to get out the needle and thread! So out came the scissors and the sewing box, we used the magazine template to cut out pieces of felt (which were contained in the free craft kit) then she followed the photo directions of where to sew. 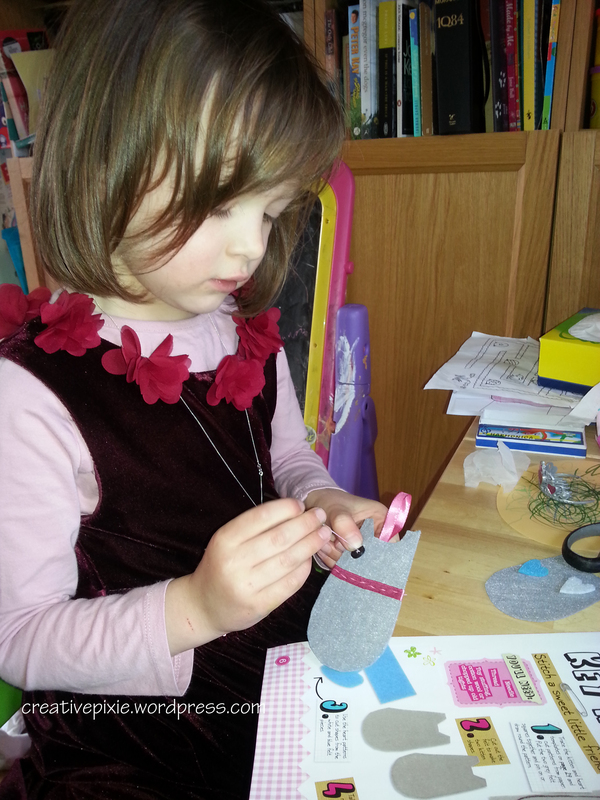 I was keen for her to do as much as she could herself and she patiently worked the thread through the felt. While doing this we both chatted about lots of silly things, sang songs and paused to eat some of her Easter egg stash. After about an hour the kitten was finished and Poppy was proud to show everyone the finished result. 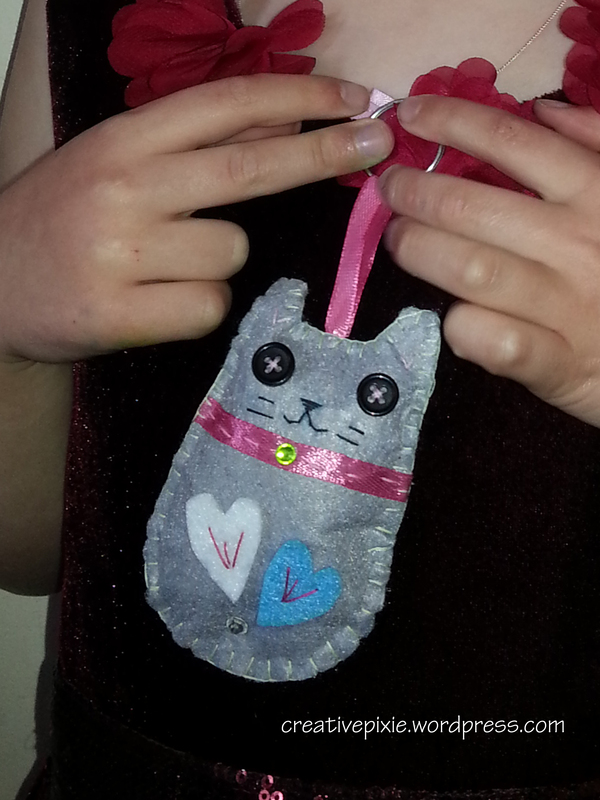 Poppy did sew everything (bar the blanket stitch which I did as she just couldn’t understand how to do it). I think she did really well, I really enjoy my craft time with her and am looking forward to making something else from the kit. Has anyone else discovered some crafty inspiration for children? That’s exactly what it’s like-Molly Makes for kids! I wonder if there’ll be more of these type of magazines printed. Wow, that’s amazing sewing for a 4 year old! Pompoms are also great to make with kids (I recently blogged about some chicks and bunnies I made with a group of kids). They’re so easy to make by wrapping wool around your fingers, and by adding eyes you can make all sorts of interesting creatures! Ooh pompoms! I’ve never heard of making them round your fingers . I remember doing it with circles of card when I was younger.I must give it a go this weekend. Thanks she enjoyed being a big girl using my sewing box. Jean, what fun! The kitten key ring came out perfectly. I think it’s delightful, and Poppy should be very proud…look at her sewing with those little, nimble fingers….sweet. Thank you Marianne for your kind words. She did a fantastic job! My daughter Lilly, who is also 4 wants to start learning how to do stitching. I am going to try to find this magazine! Thanks so much for sharing. Thanks for calling over. Ruby Loves is a great magazine, I picked up issue 2 yesterday. You might be able to order it online. Happy sewing! Kitten keyring is v sweet. Mother daughter craft time is still so precious for me and my wonderful Mum. I’m heading home later this week to get help with a dress I’m making to wear to a friend’s wedding and I can’t wait. So important no matter how old we are. That’s lovely you still make things with your Mum. I hope me and my girls will still be crafting together after they leave home. My sister and I still meet up every Tuesday evening to do ‘craft night’ with a friend.